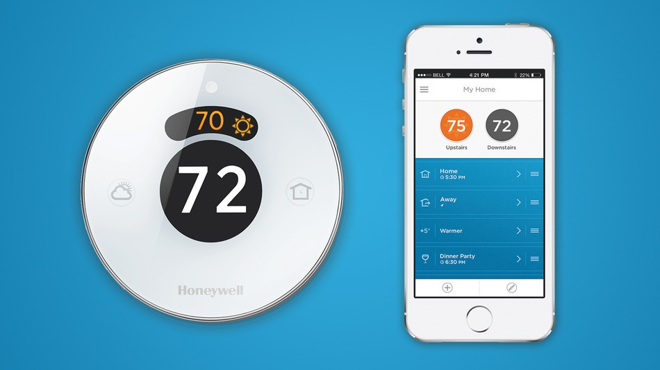 The Honeywell Lyric has joined the growing chorus of smart thermostats! Update: Lyric is now available via Amazon.com and many other retailers and HVAC professionals! Honeywell, famous for many things including being the first to cram thermostat controls into a circular shape, is late to its own party. Nest (now owned by Google) has been there for a few years. While Honeywell sicced its lawyers on Nest over a number of design trademarks and patents, Nest ran ahead and made its name synonymous with smart thermostats. The newly announced Honeywell Lyric and companion smartphone app. Honeywell’s previous entry into the smart thermostat market, the RTH9580WF, is a capable and well-designed thermostat (read our review here). We here at Smart Thermostat Guide were fans of Honeywell’s last smart thermostat, but it’s just like PC. vs. Mac all over again: sure, the PC is more customizable, but Mac has that marketing sizzle. We are optimistic about the Lyric. 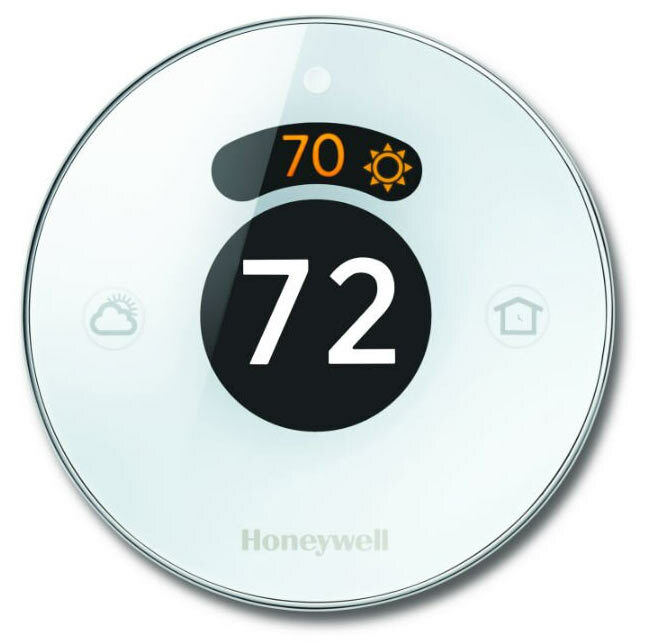 Putting Honeywell’s thermostat legacy into a stylish package ought to be a winner, assuming customers can be convinced that the Lyric is worth $30 more than the already-established Nest. Here’s a 1-minute long promotional video demonstrating the Lyric’s features. Honeywell is clearly taking aim at Nest’s “learning” algorithm by playing up the “your schedule isn’t that predictable” angle. The most interesting feature in this list is what Honeywell is referring to as “geofencing”. Rather than learn what times you leave and come home like the Nest tries to do, the Lyric simply tracks your location via your smartphone and behaves accordingly. This is a great feature for people with irregular schedules. If your schedule is such that you often come home at an unpredictable time and find the house freezing, the Lyric might be a great addition to your home. The Lyric offers a sleek and elegant update to the classic Honeywell design. Will Lyric offer data and usage logs? The lack of usage data (and comparison to others in your region) was our chief complaint about the RTH9580WF and a distinct edge Nest and Ecobee thermostats had over the Honeywell Wi-Fi thermostat. Will Lyric support a detached temperature sensor? Many thermostats are not ideally placed, and many homeowners would like to see a thermostat monitor the temperature in a room other than the one it’s in. Will Lyric save users money? Smart thermostat marketing tends to be about convenience over seeing massive savings on your heating bill. Still, the Leaf system has encouraged many a Nest owner to put on a sweater and we’d like to see the same in the Lyric. Does Lyric require a C-wire? The Nest has an infamous incompatibility bug in systems without C-wires. Stay tuned – we are eager to learn more about the Lyric and stack it up against the Nest this summer. I just bought and installed this the other week, and really love controlling it with Siri!